Nitro Concepts S300 Review ▷ Best Low-Budget Chair? Guide & Tips! Finally, the German gaming chair brand with the catchy name Nitro Concepts introduces a new model – the S300, the current top model of this brand. The E220 Evo, E200 Race and C80 chairs, which have been released so far, cost around 150 quid and are in the absolute beginner’s area while the new flagship S300 is still a complete bargain at about 230 pounds. It is also unique that the chair shines with an extremely rare fabric cover. Can the S300 score points with quality? Who is the S300 suitable for? Is he better than his direct competitor, the Racer1? I will tell you this and much more in my S300 review today! Before we come to the final line-up S300 vs Racer1, I will first take you through my practical test and describe my impressions that I gained on the Nitro Concepts S300 over the last month. Then follow as usual size & purchase advice – so stay on the ball! I usually skip this almost always the same part, but with a chair from the cheaper price range, there are quite a few black sheep regarding structure. I will be brief and say that the S300 was one of the most comfortable and fastest in my entire gaming chair career. Even fixing the backrest, which was often so tight, was easy. Let’s start at the bottom: The nylon castors are a little smaller (50mm) than used to from premium chairs of e. g. noblechairs. What difference does it make? None at all really. Thanks to the PU coating, they roll off smoothly and quietly and look high-quality. Of course, you can tilt the S300 (90 to 135 degrees) and rock it (14 degrees). The mechanics run cleanly and don’t have to hide even behind much more expensive models. The fabric cover is processed absolutely neatly. Side bolsters and seat are connected with a smooth transition, which ensures maximum legroom and pleasantly soft lateral support. The high-density cold foam feels very pleasant – it is nicely thick, and the haptics are reminiscent of a gel-like material. You can directly feel that this is a quality that is uniquely good in this price segment – more about this within the trial sitting section below. Nitro Concepts S300 is equipped with 3D armrests that can be rotated and moved forwards, backwards, up and down. 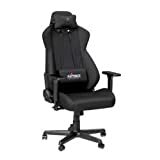 At first glance, it becomes clear that this chair is setting new standards concerning price-performance: They don’t wiggle excessively, look noble due to the black coated metal and offer a comfortable hold due to soft arm pads. The design of the backrest is not only visually but also ergonomically similar to that of the seat. Here too, there are pleasantly soft transitions – there is no pressure, and even beefier gamers have enough space in the lumbar and shoulder areas. The upholstery also excels with the same quality: It is noticeably thicker than the cheap chairs I have known of so far and feels much more comfortable and of a higher quality. The cushions of the S300 are ingenious and almost at the level of noblechairs. The cover looks robust and feels pleasant on the skin. The padding in it reminds me of gel again – it’s not gel, but the feeling of squeezing comes close to that of a gel padding. This is a very welcome feature in a price segment where you are otherwise exclusively served with rigid PU cushions. When I sat down on the S300 for the first time without any expectations, I could hardly believe that such a cheap chair could be so comfortable – and I honestly did not admit it to myself for a while. This is undoubtedly in no small part due to the fabric cover: it is soft and always at “operating temperature”. The combination of the high-quality feel and haptically appealing fabric cover with the chair’s unobtrusive ergonomic design offers an excellent sitting experience. Added to this are the soft, cuddly cushions that round off the seating comfort. Nitro Concepts calls the structure of the chair H. E. A. T. System – this sensational-sounding abbreviation stands for Health Enhancing Adjustment Technology. Even though I smiled at this a little at the beginning of my research, it seems to me now somehow appropriate to give this surprisingly great sitting feeling a name. Armrests and adjustment functions run smoothly as previously mentioned and allow the chair to be optimally adjusted. This is nothing unusual for more expensive chairs, but in the price segment that the S300 is targeting, I would like to emphasise this again. Such high-quality and flexible armrests are by no means the norm. The DX Racer1 is, as many people know, the best selling gaming computer chair in Germany – this is due to the combination of the big name DXRacer and the meagre price of 200€. Until now, there has been hardly any severe competition in this segment, which has changed with the release of the S300. The armrests of the S300 not only have two more directions but also look better and feel much better in practice. The S300 is not only visually more robust but also noticeably more robust in use. The padding of the S300 fits better to the body and is thicker at the same time – the fingers of the Racer1 touch each other when you press together with your thumb and index finger on one of the wings. The fabric cover of the S300 is softer and more velvety. While the upholstery of the racer feels more plastic-heavy in comparison, the S300 offers a real fabric experience. The dimensions of the S300 are more generous and due to its shape – especially in the area of the seat with the side bolsters merging into it – it allows even heavier, wider gamblers to sit comfortably on the Nitro Concepts Chair. The cushions of the S300 also play in a completely different league compared to those of the Racer1: Both the soft, cuddly upholstery and the fabric cover outdo the Racer’s PU. With the Nitro Concepts S300, you get a gaming chair which I think is far superior to the Racer1 and any other comparable model. Anyone who still goes for a cheaper chair due to pseudo-brand-prestige or to save a few quid is to blame himself for it. The S300 is not only the flagship of Nitro Concepts product range, but is also my secret tip for all gamers with a smaller budget. Features that I have only been used to from much more expensive gaming chairs, such as the high-quality 3D armrests, in combination with the highest quality fabric upholstery I have tested so far make the S300 extremely attractive. The ingenious cushions, the generous dimensions paired with the S300’s top load-bearing capacity, the comfortable, high-quality cold foam padding and last but not least the harmonious colourful or elegant appearance – the S300 is my number 1 in the low-mid price segment and in my opinion the first choice for fabric lovers. The Nitro Concepts S300 earns the goturback.uk Gold Award for its unique price-performance-ratio and as the king of fabric-covered gaming chairs! You can buy the S300 here on Overclockers. You can find out more about this and current offers in the purchase advice at the end of this post. Like most other chairs, the S300 is designed for the average gamer, but with its unobtrusive side bolsters and slightly larger dimensions, it also offers comfortable space for more corpulent players. The appropriate complement to this is the carrying capacity, which is quantified at 135kg. I would recommend the S300 for gamers between 1.65m and 1.90m tall and weighing up to 100kg. Depending on the combination of size and weight or the resulting stature, some of you may still be able to sit comfortably with 120 kilos – this, of course, can never be pinned down to an exact number. They not only deliver it to you at the lowest cost but also trump with awesome expertise. For this brand I would always rely on this shop.